National trucking company delivers time-sensitive defense cargo and hazardous materials using Fleetio to be proactive in maintenance and prevent vehicle breakdowns. Boyle Transportation is a national trucking company that transports security-sensitive materials for life sciences and defense clients. The fleet consists of a variety of vehicles including over-the-road tractors, rolling tarp system trailers, flat beds and reefer trucks. Boyle Transportation uses Fleetio to stay on top of vehicle maintenance and successfully transport time-critical items cross-country every day. Given the delicate nature of transported materials and the time-sensitivity of transportation, Boyle Transportation’s top priority is preventing vehicle breakdowns. For Boyle Transportation, vehicle downtime is a major expense. If a vehicle breaks down, the company risks missing scheduled deliveries and not maintaining transported materials’ controlled temperatures. Before Fleetio, Boyle Transportation’s professional drivers would have to personally call management when there was a vehicle issue, which really slowed the maintenance process. Drivers could not access any vehicle information from the road. In addition, fleet information was often out-of-date, inaccurate and disorganized given their reliance on paper forms and inability to access information on the go. 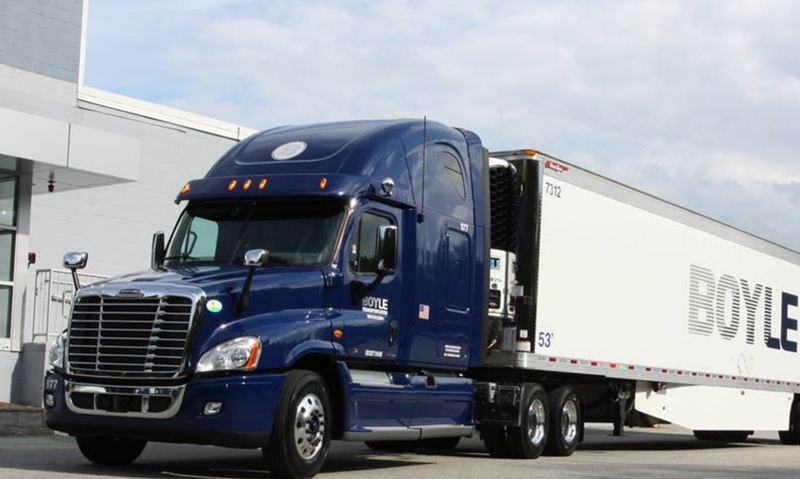 Boyle Transportation realized it needed a modern fleet maintenance solution that’s hand-held accessible, cloud-based and customizable to its specific needs. Employees needed up-to-date vehicle information with the ability to access it from the road. Fleetio was a perfect fit. Boyle Transportation uses Fleetio to proactively schedule and conduct vehicle maintenance and efficiently resolve unexpected issues. "Fleetio makes up 40 percent of what I do. I plan my day based on the Fleetio dashboard." Since adopting Fleetio, the professional drivers have become more involved in the maintenance process. The Fleetio Go mobile app has equipped drivers to take more control of the vehicle inspection process and resolve vehicle issues in real-time. Fleetio is also integral to drivers’ daily routines and is incorporated in driver training programs to educate drivers on common vehicle issues and methods to address them efficiently. “Fleetio is in everything we do,” says Ernest Acevedo, Fleet Maintenance Supervisor at Boyle Transportation. Maintenance technicians save around 30 minutes per day after switching to the Fleetio smartphone app for maintenance. The hand-held accessibility streamlines fleet issue resolution and allows all employees touching the fleet to better communicate. Boyle Transportation’s fleet information is organized now that it’s stored in a mobile, cloud-based system and constantly updated. Every DOT inspection form, for example, is digitally linked to a specific vehicle, leading to more efficient record keeping. This improved organization enables the fleet to save money by avoiding repeat paperwork and repairs. The customizability of Fleetio also enables the fleet to stay up to speed on compliance and adjust their inspection forms accordingly. With improved communication, mobile accessibility and more efficient operations, Boyle Transportation gets ahead of potential maintenance issues and prevents vehicle breakdowns.